Dacey, Private David of the 2nd Monmouthshire Regiment, from Brecon, who died suddenly on active service on 24 April 1918, aged 38 years, in his camp in France, and was buried in the military cemetery at Lakreule, near Hazebrouck. He had spent almost two years in France in the trenches, fighting at Ypres, Arras, Bapaume, Poperinghe and Hazebrouck. He left a widow and nine children. His record of service, death and the letters to his widow from his chaplain and sergeant were reported in the Brecon & Radnor Express Carmarthen and Swansea Valley Gazette and Brynmawr District Advertiser of 23 May 1918. Dallow, Private Henry (Harry) of D Company of the 2/1st Battalion of the Herefordshire Regiment, from Yatton, who died by drowning in the River Ouse, Bedford, aged 19 years. There are reports of the inquest into his death and of his funeral in Yatton in the Chronicle. Dangerfield, Driver, Joseph of the 3rd Glamorgan Battery, 2nd Welsh Brigade, who gave evidence in a case of a stolen skirt before the magistrates on 25 October 1915. 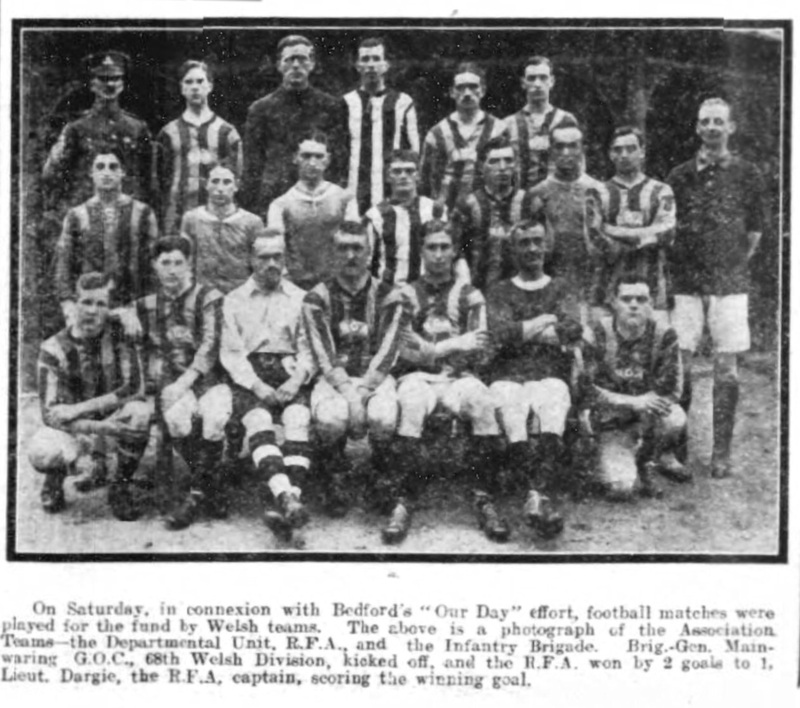 Dargie, Lieutenant of the Departmental Unit, RFA, who scored the winning goal in one of the football matches on 23 October 1915 played for the “Our Day” fund of the Order of St John of Jerusalem and the British Red Cross Society. Davey, Lieutenant-Colonel J H commanding officer of the 21st Welsh (Howitzer) Brigade, Royal Field Artillery. David, Gunner of the 1/2nd Welsh Brigade, Royal Field Artillery, who competed in the military aquatic sports in July 1915. Davies, Rev Ceitho chaplain, of Abercarn. Davies, Daniel Sunders of the Cardigan Battery, Royal Field Artillery, from Felinfach. Davies, Sapper D G of the 2/1st Welsh Field Company, Royal Engineers, who was honoured by the Royal Humane Society, with Sapper E Rees, for rescuing a drowning woman from the River Nene at Northampton on 4 May 1915. Davies, Private D J of the Signalling Section, the Royal Engineers, from Brynamman. Davies, Gunner D J Saunders of the Royal Field Artillery, from Ystrad. Davies, D R Rev and Captain Chaplain of the 23rd Royal Welsh Fusiliers, and senior curate of Llangollen. Davies, Private J Elwyn of the 1/4th Welsh Regiment, from Carmarthen, who died in Alexandria on 13 August 1915 of wounds received in the Dardanelles. His letter to the Reverend J Dyfnallt Owen written on board ship in Mediterranean on his way to the Dardanelles was included in a long article headed ‘Tales of the 4th Welsh’ in the Carmarthen Journal and South Wales Weekly Advertiser of 10 September 1915 which included letters from other soldiers involved in Dardanelles campaign. Davies, Lance-Corporal Fred of the Brecknockshire Regiment, who was married in Bedford in April 1916. 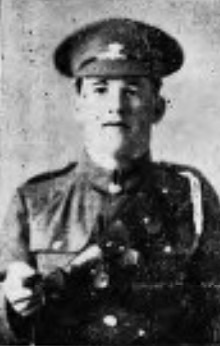 Davies, Lance-Corporal Fred stationed in Bedford, from Llanwrtyd Wells, and recorded in the Brecon & Radnor Express Carmarthen and Swansea Valley Gazette and Brynmawr District Advertiser of 9 March 1916 as having left from home leave, his destination being abroad. Davies, Gilbert of the Royal Engineers, Surveyor of Cwmamman Urban Council, who wrote to H Herbert JP from ‘Somewhere in Gallipoli’ on 17 August 1915. 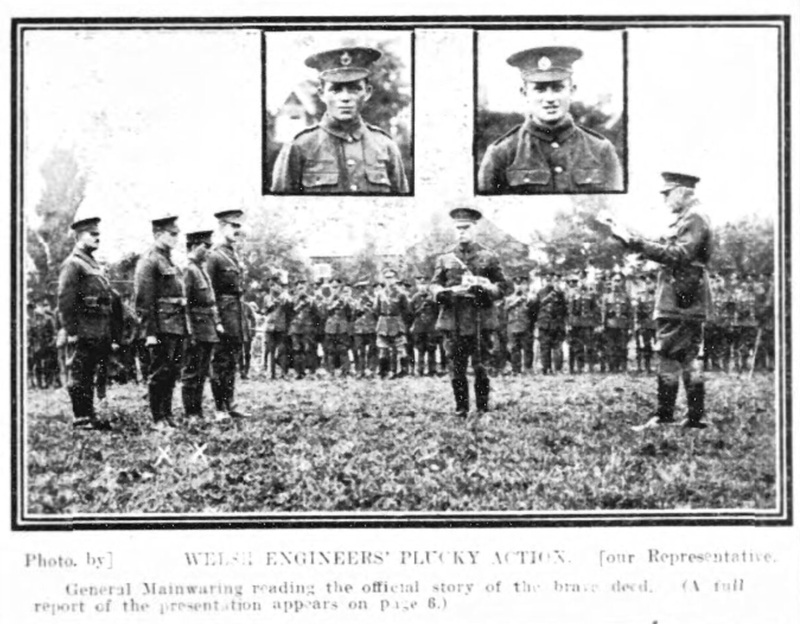 His regiment had left Bedford on 18 July, and his long and colourful description of the arrival, the fighting, the engineers’ work, the enemy and every day life in the trenches was printed in full in The Amman Valley Chronicle and East Carmarthen News of 21 October 1915. Davies, Gunner J Gordon of C Battery, 341 Brigade, Royal Field Artillery, who had initially enlisted in January 1916, it was reported in the Cambrian News and Welsh Farmers’ Gazette of 14 January 1916 under the heading ‘Patriotic Example’, in the Cardiganshire Battery of the 2/2 Welsh Brigade of the Royal Field Artillery, from Aberystwyth, whose younger brother, Lieutenant J Norman Davies (below) was with the 2/7th (Montgomery and Merioneth) Battalion, Royal Welsh Fusiliers. 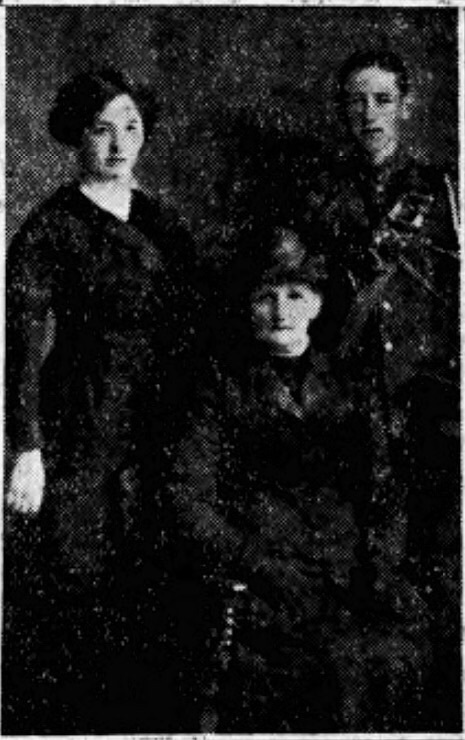 Davies, Lieutenant J Norman of the 2/7th (Montgomery and Merioneth) Battalion, Royal Welsh Fusiliers, reported as being promoted from Second-Lieutenant in the Cambrian News of 7 July 1916, from Aberystwyth, articled to his father, Mr Joseph Davies, district registrar of the High Court of Justice, registrar and high bailiff of Aberystwyth Admiralty, Bankruptcy, and County Courts, chairman of the Court of Referees for Mid Wales under the National Insurance Act and chairman of the Munitions Tribunal for the Mid Wales district. His uncle was Lieutenant-Colonel J Davies-Jenkins JP (below), in command of the Battalion, and his elder brother, J Gordon Davies (above), had been serving as a gunner with C Battery, 341 Brigade Royal Field Artillery, at Bedford, from the beginning of 1916. 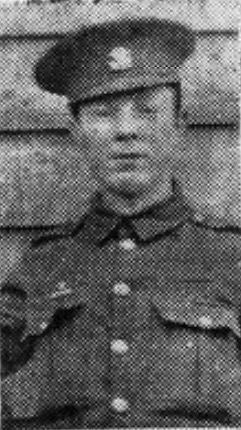 Davies, Signaller John of the Royal Engineers, from Ystrad. Davies, Corporal Johnnie from Cwmyglo. Davies, Private Rex Blisset from Corwen, who accompanied the bridegroom, his brother, at his wedding in November 1915. Davies, Sergeant Rowland of the 2/6th Battalion, Royal Welsh Fusiliers, from Cwmyglo. Davies, Bugler T of the 2/7th Cheshires, who took part in the Easter Monday Eisteddfod in the Skating Rink in April 1916. Davies, Private W invalided back to Bedford hospital in March 1915, having received a shrapnel wound in the face in the battle of Neuve Chapelle, from Cwmavon. The Herald of Wales of 27 March 1915 reported that several Cwmavon men were engaged in the battle and would henceforth bear unmistakable marks of the ordeal. 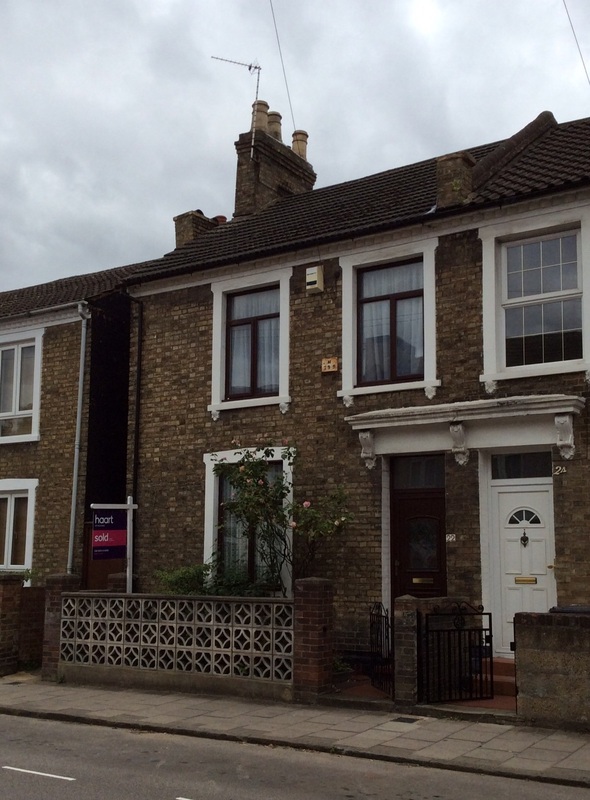 Davies, W C of the 2/1st Brecknockshire Regiment, billeted at 17 Palmerston Street, Bedford, where his infant son died. Davies, Private W J of the Royal Field Artillery, from Ystalyfera, whose brother, Private Alcwyn Davies, was with the Brecknocks at Milford Haven, and his cousin, Private W J Davies was with the King’s Own Light Infantry, back in France in September 1915 after recently being wounded and on a visit home. Davies, Driver W J of the 1st Glamorganshire Battery, Welsh Howitzer Brigade, from Ystalyfera. Davies-Jenkins, Lieutenant-Colonel J JP in command of the 2/7th (Montgomery and Merioneth) Battalion, the Royal Welsh Fusiliers. His nephew, Lieutenant J Norman Davies, served as an officer in the Battalion, and nephew J Gordon Davies (Lieutenant Davies’ elder brother) served as a gunner in C Battery, 341 Brigade Royal Field Artillery (above). Davis, Sapper J of the 1/1st Welsh Company, the Royal Engineers, played in a cricket match against The Barracks, Kempston, on 3 July 1915. Davis, Sapper J O of the 1/1st Welsh Company, the Royal Engineers, played in a cricket match against The Barracks, Kempston, on 3 July 1915. Densley, Private Percy of the 2/2nd WFA, who took part in the Easter Monday Eisteddfod in the Skating Rink in April 1916. Dowdeswell, Major William of the 5th Battalion of the Welsh Regiment, from Pontypridd, who fought in Gallipoli and was invalided home on 7 October 1915 with chronic dysentery. Major Dowdeswell survived the war and died in 1930, the cause of his death being attributed to his time in Gallipoli. Downey, Private J of the 2/1st Brecknockshire Regiment, B Company, second in the troops cross country race in Bedford on 26 July 1916. Drinkwater, Captain-Surgeon Fred of the 2/3rd Welsh Field Ambulance, Royal Army Medical Corps, from Llangollen, Chairman of Llangollen Urban District Council, home on a short visit from Bedford in May 1916 and ‘looks in capital health’. His younger brother was Frank (below). A letter from Captain-Surgeon Drinkwater to the Council acknowledging the action of the Council in electing him to the chairmanship in his absence was reported in The Llangollen Advertiser of 9 June 1916 and was also referred to in an article about the appointment in the Llangollen Advertiser, Denbighshire, Merionethshire and North Wales Journal of 9 June 1916. Drinkwater, Lieutenant Frank from Llangollen, joined his regiment in France in November 1915. By May 1916, as Captain Drinkwater, he was on active service in Egypt and, according to the Llangollen Advertiser of 19 May 1916, was ‘a genuine sportsman – a term that in these days is equivalent to ‘one of the best’ – … and was last heard of playing pool amongst the Pyramids’. His elder brother was Fred (above). Duff-Gordon, Lieutenant Cosmo of the 2nd Battalion, the Herefordshire Regiment, afterwards attached to the Machine Gun Corps, from New Radnor, killed in action whilst serving with the Corps on 2 September 1916, aged 19 years. Dutton, Gunner of the 1/1st Cheshire Brigade, Royal Field Artillery, who competed in the military aquatic sports in July 1915. Ede, Lieutenant A H of the 2/7th Royal Welsh Fusiliers, officer representing the composite Battalion at the troops cross country race in Beford on 26 July 1916, and a runner in the race. Edwards, Lance Corporal of the 2/1st Brecknockshire Regiment, B Company, runner in the troops cross country race in Bedford on 26 July 1916. Edwards, Edgar of the 1/4th Battalion, the Welsh Regiment, from Portfield, killed at the Dardanelles in 1915. Edwards, Sapper Hugh G of the Royal Engineers, stationed in Bedford at the Haynes Park Camp, and who wrote a letter to his local paper about billeting, published in the 26 February 1915 edition. Edwards, Reverend Captain J serving as Chaplain to the Welsh Troops at Bedford. Edwards, Reverend J from Portmadoc, lately pastor at Memorial Congregational Church, chaplain with the Welsh Army, who had been at Bedford for about 12 months before leaving for France in August 1916. Edwards, Private Thomas of the 1st Cardigan Battery, Welsh Brigade, Royal Field Artillery, from Llanrgwyryfon. Thomas was one of four brothers – Private David Edwards was in Australia when war broke out, joined an Australian regiment, fought at Gallipoli where he was wounded, spent time in hospital in Gibraltar and London but by January 1916 when home on leave was almost completely recovered; Driver Richard Edwards was with the Welsh Brigade at the front in France; and Evan Edwards, in the Glamorgan Constabulary had attested under the Derby scheme. Ellis, Captain J G of the 2/4th Royal Welsh Fusiliers, runner in the troops cross country race in Bedford on 26 July 1916. Evans, Private Clancy of the Monmouthshires, from Ystradgynlais, who joined up in October 1914 and had since married a Bedford lady but would again settle at Ystradgynlais at the end of the war, it was reported in December 1917. Evans, T4/251616 Sergeant D J of the RASC Supply Section, 53rd (Welsh) Division, from Pentre, who kept a diary during the war, both the original typed diary and a transcribed copy diary being found at Rhondda Remembers. Sergeant Evans was stationed in Bedford from May 1915 prior to leaving in July for Gallipoli as part of the Mediterranean Expeditionary Force. 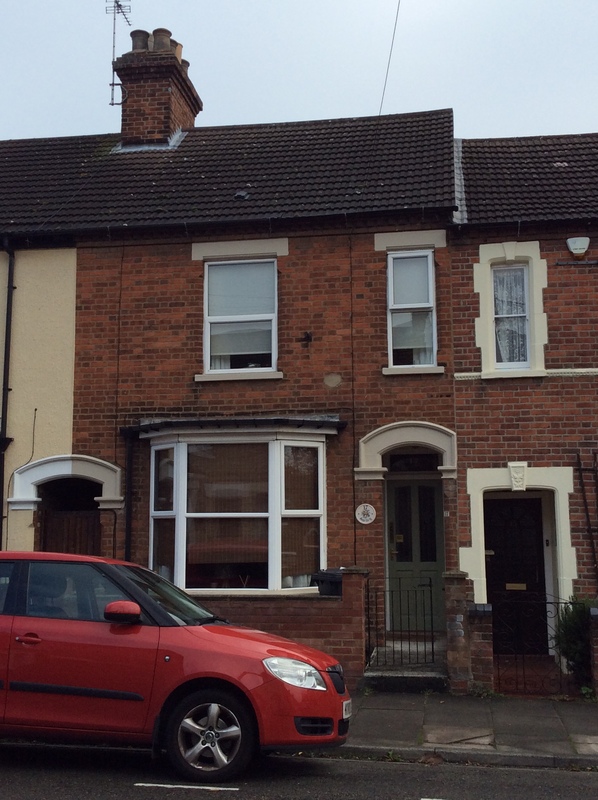 Whilst in Bedford, mam and dad visited him in July and stayed at 22 Western Street. His diary begins with receipt of his mobilisation order on 4 August 1914 and concludes when his army service finished on 1 August 1919, and includes at the end a list of places visited, information about the 53rd Division, and information about the Egyptian Expeditionary Force (strength, supplies, and railways constructed). Evans, Sapper Dannie D of the Royal Engineers, from Aberayon, home on leave at Christmas 1916 after nearly 18 months active service in France. Evans, Major David of the Royal Field Artillery, who took about seven men who had elected to join forthwith from Aberayron to Bedford on 28 December 1915, including G Emrys Herbert, John James Jones, Daniel Jenkins and David Morgan Evans. Evans, David Morgan of the 2/1st Cardigan Battery, Royal Field Artillery, from Aberayon. Evans, Driver E T of the 68th Motor Air Line, SM, from Aberaman, stationed at Haynes Park, near Bedford. His brother, 39637 Corporal D J Evans, of the South Wales Borderers was killed in action in France on 16 August 1917. 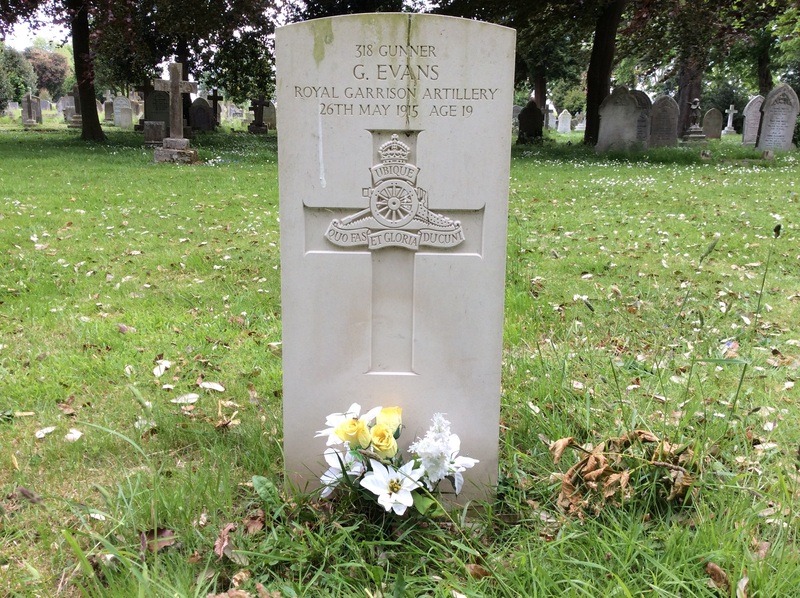 Evans, 318 Gunner Griffith of the Welsh (Carnarvonshire Battery), Royal Garrison Artillery, from Bethesda, who sadly drowned whilst bathing at Kempston, Bedford, on 26 May 1915, at a place known to the villagers as the whirlpool. He was a good swimmer and it was believed he was seized with cramp. The coroner and jury at the inquest warmly praised Gunner Evans’ comrade, Evan Thomas, a non-swimmer, who had attempted a rescue. A verdict of accidental death was returned. The funeral took place in Kempston and Gunner Evans is buried in the cemetery there. Evans, Sergeant Haydn of the ASC, No 2 Corps, who took part in the Easter Monday Eisteddfod in the Skating Rink in April 1916. Evans, Private J from Bethel. Evans, Private J R of the 6th Battalion, from Ebenezer. Evans, Bandsman Owen from Dinorwic. Evans, Second-Lieutenant R S of the 1/5th Welsh, and referee at the boxing competition held in Russell Park, Bedford, in June 1915. Evans, Sergeant T of the Herefordshire Regiment, from Newbridge-on-Wye. Evans, Gunner Thomas Henry of the 1/4th Welsh (attached to the Cheshires), from Llandovery. Evelyn, Lieutenant F H L of the 2nd Battalion, the Herefordshire Regiment, commanding the first reinforcement draft of 47 men who left for Gallipoli in August 1915. Falcon, Lieutenant of the 1/1st Welsh Company, the Royal Engineers, played in a cricket match against The Barracks, Kempston, on 3 July 1915. Fischer, Fitter A of the 1st Welsh Howitzer Brigade, 53rd Welsh Division, from Swansea, competitor in the water polo tournament at Bedford in June 1915. Fletcher, Driver of the 2/2nd Welsh Field Ambulance, RAMC, who played in a rugby match against the 2/1st Welsh Division Signal Company on 13 November 1915. Ford, Lieutenant-Colonel Percy B commanding the 2/3rd Battalion, the Monmouthshire Regiment, who wrote from Battalion Headquarters in Bedford in December 1915 to the Abergavenny Chronicle to refute extraordinary rumours floating about Abergavenny about the Regiment. He was a judge at the Easter Eisteddfod in April 1916 and had been fined in February 1916 for not screening lights at the house in Biddenham in which he and his wife were living.